LG BP645 review | What Hi-Fi? The LG BP645 sits somewhere in the middle of the company’s latest range of Blu-ray players. It’s good, but good isn’t quite enough to hold off the competition, some of which is mighty strong. We begin by putting in a Blu-ray of Captain America: The Winter Soldier and loading time is short. The picture is unrealistically sharp at first, to the point of looking noisy and processed. Thankfully the LG offers options to fine-tune the picture. The Info/Menu button leads to various presets (Standard, Vivid, Movie) as well as finer user settings. We knock down the sharpness levels a couple of notches. In both 2D and 3D it’s a punchy picture. Colours are bold and lines are clearly drawn. We’d like more subtlety, however. We try a DVD and the LG’s upscaling skills are just fine. The amount of picture noise and edge softness is minimal, and colours retain their impact. A good picture, then, but not amazing. And it’s the same story with sound, although there’s certainly plenty of sonic detail on offer. We watch Tom Cruise punch some robots in Edge Of Tomorrow and there’s a good sense of texture to the crunching metal. It’s also an agile sound. We’d like more weight, however. Explosions and gunfire (and even speech) aren’t quite as full-bodied and authoritative as we’d like. The sound is entertaining, but not fully engaging. Time to examine the box itself. It looks smart enough, but it won’t win any beauty contests. Still, it’s easy to set up and then ignore. The back offers the standard connections we’d expect of a budget Blu-ray player: HDMI out, digital optical out, ethernet. The front features a USB port for memory sticks. Internal tricks include wi-fi and DLNA for accessing content on networked computers. Here’s an unusual one: the Private Sound Mode 2.0 lets you send sound from the Blu-ray player to your smartphone or tablet, where you could listen with headphones. It’s a neat way to avoid waking the family up at night. The smart hub has an excellent selection of apps: BBC iPlayer, Amazon Instant Video, Netflix, Blinkbox and YouTube. Samsung may have 4oD and ITV Player, but LG counters with Spotify and Now TV, which seem absent anywhere else. 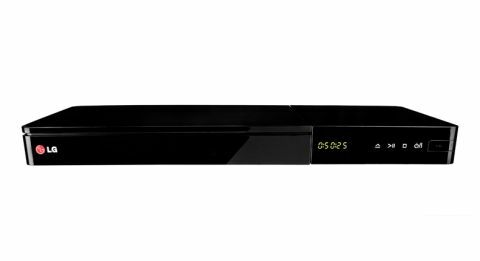 For the money, the LG BP645 is a good Blu-ray player. Its picture and sound performance is not class-leading, but if some of those features appeal, it’s definitely worth investigating.